There is a lot of construction activity either underway or planned along 4th Street with something going on at almost every block from the National Mall to N Street. Above is a map of construction projects along the corridor with a summary of each project listed below from north to south. Going south on 4th from the National Mall, the first project that comes up is the reseeding of the lawn on a section of the Mall stretching from 7th Street to 3rd Street. 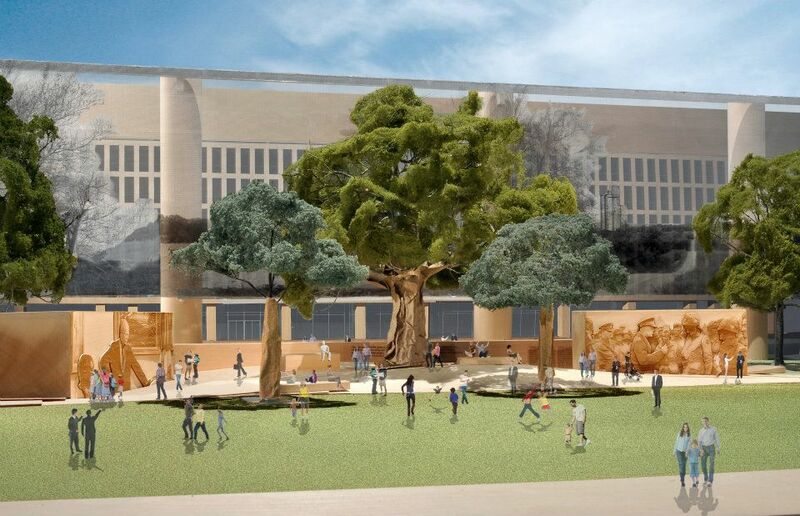 After crossing Independence Avenue, the west side of the street in front of the Department of Education will be transformed into a memorial to President Eisenhower. The memorial will take up the rectangle bordered by 6th Street to the west, Independence Avenue to the north, 4th Street to the east, and the Department of Education headquarters to the south. There’s been a lot of controversy over the memorial’s design, done by famed architect Frank Gehry. On the next block between C Street and D Street, renovations continue at the Mary E. Switzer federal building. Interior work is being done, along with the creation of green space along C Street that will replace the surface parking lot that once was there. At the northwest corner of 4th & E Streets, the new Consolidated Forensic Laboratory (CFL) is nearing completion. I took a tour of the building last fall (unfortunately we were not allowed to take photos inside) which will include a forensic lab, MPD test firing range, and the coroner’s office. Interior build-out is underway. 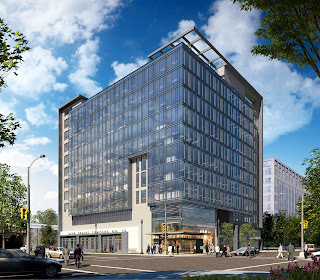 On the southwest corner of the intersection, a new office building with the address 400 E Street will replace the parking lot, and a new Engine 13 firehouse will be on the ground floor on the 4th Street side. In addition, there will be space on the E Street side for DC Central Kitchen and KidPower. A sign on the lot says the building will deliver in the 4th Quarter of 2013, but I don’t see that deadline being met since a major tenant hasn’t been lined up yet for the office building and construction has not begun. On 4th Street from School Street to I Street, a bike lane has been created on either side of the street. The bike lanes were supposed to be installed a couple years ago shortly after the I Street to M Street segment was done, but better late than never I guess. 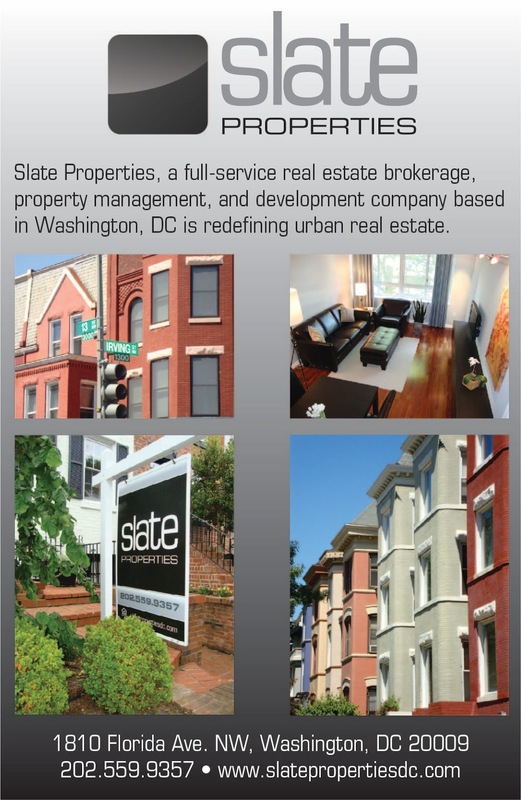 Potomac Place Tower, the condo conversion by Monument Realty at 800 4th Street has sold over 80% of its 396 units and is the largest condo project currently selling in the city. The northeast and northwest parcels of Waterfront Station are currently slated for residential. Construction on the northwest parcel may begin in 2014 once Sky House Apartments are completed a couple blocks south. The District owns the northeast parcel and the timetable for issuing a RFP has not been determined yet. Construction at Sky House I Apartments began in February, the conversion of the former EPA towers at Waterfront Station by Urban Atlantic and the JBG Companies. Upon completion, both buildings will contain 530 apartments with 20% set aside as affordable housing for households earning up to 50% of Area Median Income (AMI). 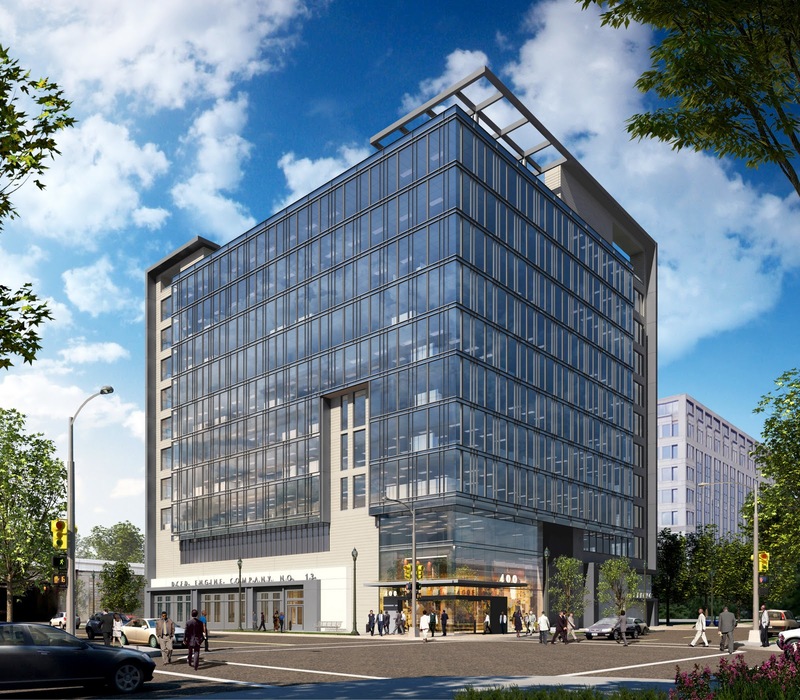 The two vacant lots (well, one of those lots has a Bank of America trailer) at Waterfront Station fronting M Street are slated for office buildings. No timetable has been set yet for construction. 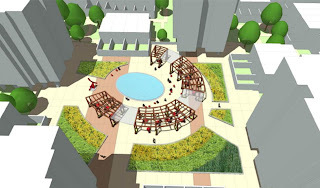 Tiber Island is planning to redo the stark, wind-swept plaza area that connects the four towers at the complex with a new oval-shaped fountain, seating, a pergola, and plantings. What are the northeast and northwest parcels of Waterfront Station? The empty grass fields that are currently there? SWag: yes, they are the grassy fields to the north of the existing office buildings. Thanks, Will, for another excellent community development update.